John Shields has traditionally drawn his inspiration from the foods of earlier times. He named his Baltimore restaurant, Gertrude’s, after his grandmother Gertie—who’d roast a plump chicken every Sunday to feed a dozen or so family members (and repurpose the leftovers throughout the week). And the recipes Shields has shared over the years—in his numerous cookbooks and as a host of PBS’s Chesapeake Bay Cooking, date as far back as the 18th century, when the Chesapeake Bay crawled with crabs and overflowed with oysters. “We just can’t eat like that anymore,” says Shields, 67. “There’s not anywhere near enough crab in the bay to feed everyone who likes it.” In fact, he points out, only a small portion of crab consumed in Maryland is harvested locally. 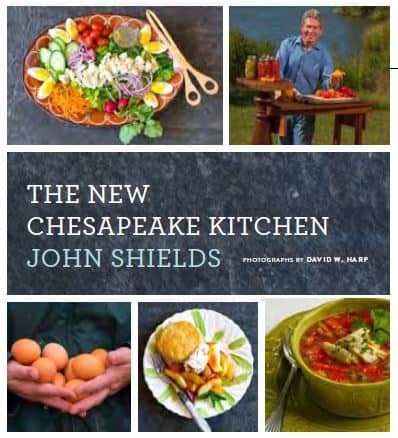 Shields’ new cookbook, The New Chesapeake Kitchen, is packed with recipes that “stretch the protein source,” he says. Instead of Maryland crab soup dense with meat, he proffers a base of grain topped with vegetables and a small amount of crab. “We heartied it up into a stew so you can feed six to 10 people using just one pound of meat,” he says. Shields describes his recipes—including Blue Cat Seafood Hash; Fig, Arugula and Goat Cheese Flatbread; and Aunt Bessie’s Crab Pudding (below), as “reimagining Chesapeake cuisine for the 21st century.” He says he’s been ruminating over this approach to food for 30 years, even as he’s seen availability of chickens swell through factory farms—not a positive development in his opinion. “The ensuing waste from these facilities puts enormous stress on our creeks, streams, waterways and groundwater and severely diminishes the water quality of the Chesapeake,” he writes in the book’s introduction. Boy, I love this crab pudding! It’s one of my favorite Chesapeake dishes and a great way to stretch that precious crabmeat. With crab cakes, I could only feed three people with one pound of blue crab, but my Aunt Bessie magically turned a pound of crab into a dish that can feed a crowd. 1. Butter a 9 x 9 inch casserole or baking dish. 2. In a skillet, melt the butter or bacon drippings over medium heat. Add the onion, celery, mushrooms and bell pepper. Sauté for about 5 minutes or until soft. Remove from heat, gently fold in the crabmeat and set aside. 3. Place half of the diced bread in the bottom of the prepared baking dish. Spread the crabmeat vegetable mixture over the top. Place the remaining diced bread on top. 4. In a mixing bowl, combine the eggs, milk, cream, salt, pepper, Worcestershire sauce and Tabasco. Mix well and pour evenly over casserole. Cover with aluminum foil and chill in the refrigerator for an hour or more.